RANTWICK - Commuter Cycling in London Ontario | A Bike Blog: It Has A Pulse! This blog I mean. This blog has a pulse. I don't know if I will ever re-engage to the point that I'm posting all the time again, but I sure as hell want to keep it alive. That said, writing about how awesome the cooler temps are and how joyful riding is Every Autumn gets a little old when you're on your 10th year, no matter how true it remains. You know what is always welcome (at least according to some readers) though? Talking squirrels in youtube videos! Yeah, baby. Some things just scream cool, no matter how often they're done. Not that you'll get any of that today. Today is just "this blog has a pulse" day. Sit tight, dear reader, "the squirrels are coming, The Squirrels Are Coming"! PS - If you read that last sentence in a "The British Are Coming"! kind of way, you were totally picking up what I was laying down. If not, you are not at fault for being kinda normal. For more on WTF Syndrome and Attacks, just search this blog a little. Welcome back! IMO, enjoying cooler temps and watching the approaching Autumn color never gets old. Hi Steve! 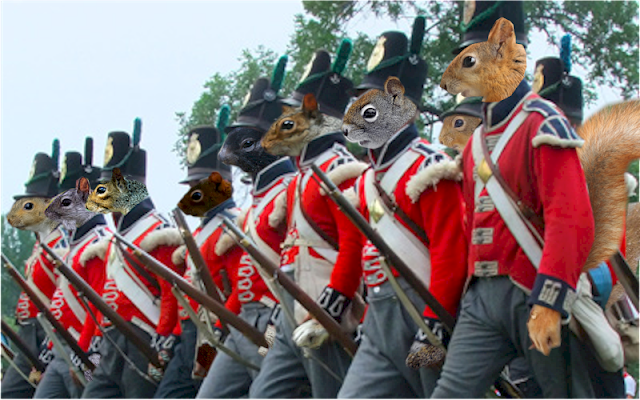 What about British Squirrel Military History?